In order to produce the best race possible, we have had to make hard decisions. To maximize your experience and to ensure smooth roads and clean water for you, we have weighed all options and have had to change venues to preserve the quality of The QuakerMan Triathlon. 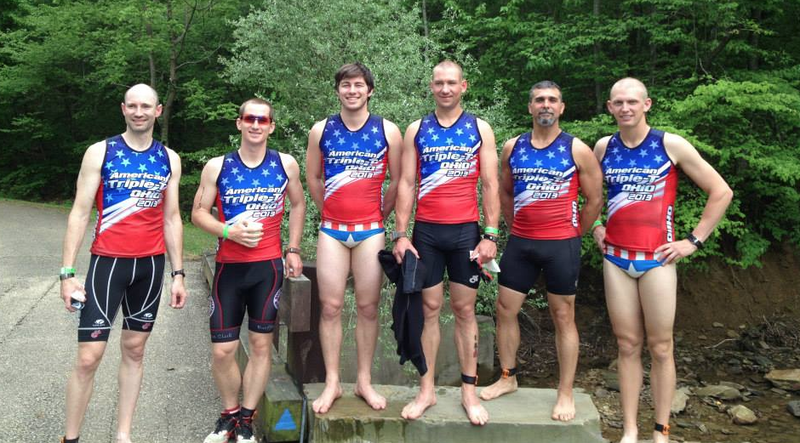 The QuakerMan Triathlon location has changed for THIS year. 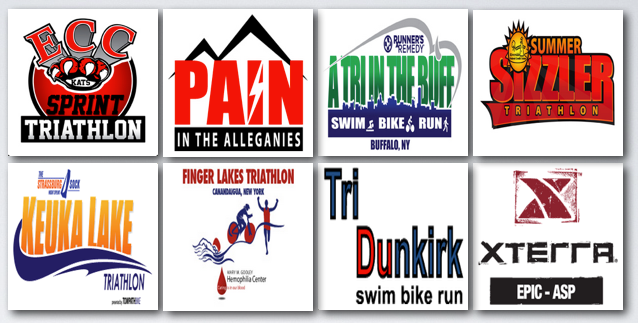 Same packet pickup – Saturday at Bert’s Bikes in Orchard Park. New Location: Only 20 min from Orchard Park! 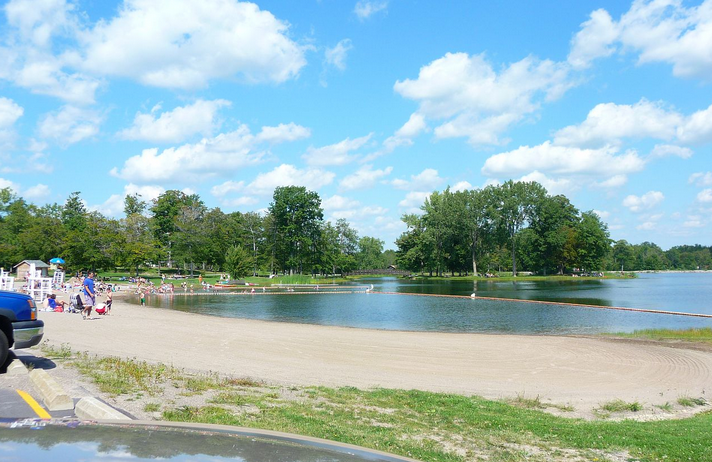 Please visit the Darien Lake State Park website to see the beauty that awaits you. Joe Rosati is the King of Pain. After listening to his story for a couple hours last February, this is the only logical conclusion I think a reasonable person could come to. 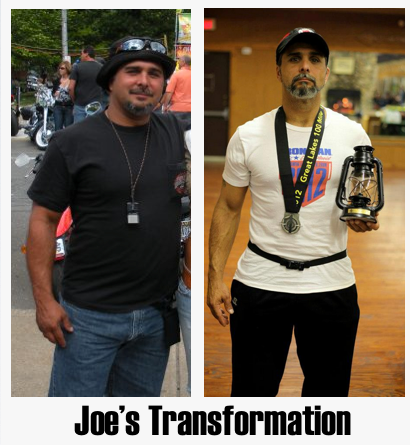 This is his story: Joe is three year BTC member who loves to ride Harley’s, hunting in the fall and has an athletic background that prepared him well for the stress and pain of triathlon training. Already a varsity wrestler in seventh grade, Joe was pushed hard by competing with his 13 month older brother Tony. With Tony being more experienced and roughly the same size as Joe (126 lbs), Joe had to get down to 119 lbs if he wanted to wrestle for the varsity team. At the age of 12, Joe was already struggling with shedding 7-10 lbs on match weeks so that he could get down to his required weight. He was learning hard lessons on balancing strength, agility, speed, pain tolerance and weight control. Sound familiar? Joe and Tony were both accomplished wrestlers having both placed in the state qualifier at the club level and they both went to the Eastern Regionals at Lafayette College in PA. Many years later when Joe Jr. was ready, Joe Sr. coached him and 5 other kids to qualify for the tournament of champions in Columbus Ohio. In his working life, Joe transitioned several years ago from welding and truck mechanic to become an Employee Assistance Representative at General Motors. In a job he feels great about, he is helping people in crisis with many different problems including: Drug and alcohol abuse, eldercare, marital and end of life issues. Multisport is also a means to help others. He mentioned several family members, coworkers, neighbors and friends who have started endurance athletics by following his lead. On the family front he is a married to Nicole. She can recently be seen with Joe at UB training swims. A new runner Nicole has started to show some nice results at area races. I don’t think anyone would be surprised if we see her at TRI events in the near future. Joe and Nicole have three kids: Julia (11), Gabriella (14) and Joe Jr. (20). Joe doesn’t let training get in the way of spending time with them. His philosophy is that his training should not inconvenience the family and he tries to get the bulk of his training done in the afternoon when just home from work or early morning on the weekends before they wake up. Joe says their support is to why he can do Multisport and long events. “They really enjoy going to races and consider the travel races to be mini vacations.” They can’t wait to get back Lake Placid this year… We will get to that. Until about three years ago, Joe’s athletic thing was lifting weights. He loved pumping iron and what it did for his fitness. Never gave a thought to endurance athletics. But by age 41 his joints started to hurt and he was gaining weight that made him bulkier then he wanted to be. In pain and ready for a change, he came home one night in January ’11 and told his wife Nicole that “I’m done lifting. I’m going to start running.” Nicole laughed at the notion. The next day he signed up for the Grand Island Half Marathon. At 5’ 6” and 200 lbs at the time, Joe was quite a load on the treadmill as he explained: “bam, bam, bam…I was hammering it!” Joe was determined though. Started running one mile the first day and worked to three miles a day until his knees hurt and he felt beat up. A wise friend at the gym told him to start losing some bulk to save his joints and to go to Fleet Feet and get fitted from some proper running shoes. He did that although once there he wasn’t too keen on the flashy running shoes. The salesperson at Fleet Feet told him to “get over it”. He “got over it” and the next day he pounded out four miles on the tread mill and worked up to eight miles upping his mileage by a mile each day. Bitten by the running bug, Joe starting checking out Runner’s World online and started reading articles, blogs and posting in discussion groups. With three months to train for the GI Half, Joe was dialed in. He set his goal: finish the race in less than two hours. With three months to train, he worked up to a route from his house that was six miles out and back. At packet pickup for the GI Half a woman at registration asked Joe “is this your first half?” Joe said “yes”. She replies…”much different than a 5K”. Joe replies to her “I wouldn’t know, I’ve never done one”. She was dumbfounded. In preparation for the GI Half, Joe trained on pace, listened to what he read about race pacing and turned out a nice 1:56 finish. His wife and kids volunteered and they all had a blast cheering on dad. 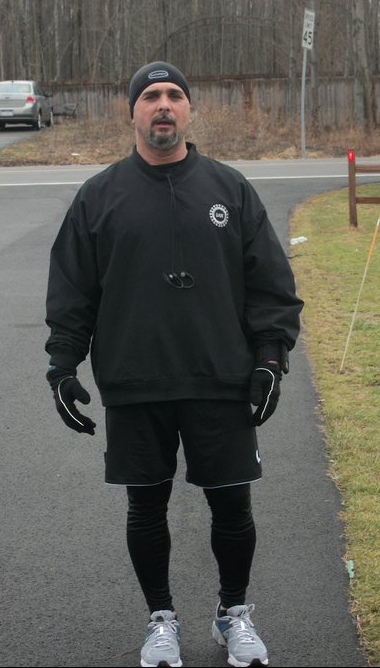 Pumped by his success, Joe immediately signed up for the Buffalo Half Marathon 30 days later. With hard work paying off, Joe’s Buffalo finish time was 1:49. Excited by his success, he was running all the time and started to develop hip pain. Researching some more he found out that he should be cross training to develop core strength and avoid injury. So Joe jumped on his old mountain bike and started riding. He did 62 miles on the mountain bike at the Ride for Roswell that June. Enjoying the biking, Joe went to Bert’s and bought a Cannondale road bike. Soon friends took notice of what Joe was doing and a co-worker of Nicole’s (Jeff Tracy) mentioned to her that Joe should be checking out Triathlon. Joe liked the idea except he didn’t know how to swim: “I’m a rock in the pool” he says. He worked around it and signed up for the Duathlon at Quakerman and placed a remarkable 3rd in his AG. Is Joe happy with this result? No. He sees at the race that the Triathletes get medals three deep in Age Group and the Duathlon folks only get a medal for the AG winner. He is pissed. Joe wants a medal. So he signs up for the Summer Sizzler about six weeks later and starts to swim. But Joe doesn’t know how to swim. Oblivious to the danger and outfitted in a used JetSki Wetsuit, Joe bounds into the water at the Sizzler and goes hard for 50 yards. And then like lots of newbie open water swimmers (this writer included), he flips on his back, does breast and backstroke and gets out of the swim alive. But this race has more newbie fun in store: Shortly after Joe starts the bike, a bee flies down his shirt and stings him. He manages to stay on his bike and gets back to transition only to find someone has racked their bike in his spot. Panicking because he doesn’t know what to do, he finally decides it’s OK to rack his bike next to the bike in his spot and he moves on to the run. Joe finishes with a respectable time but not on the podium. Joe is a bit tweaked by his Summer Sizzler results. He is aware that if he had a Tri bike he would have been faster. About this time, Joe and Nicole went for a long bike ride and she tried out his Cannondale road bike. Having never been on a quality road bike with clip-ins she can’t believe how great the bike feels. She tells Joe “I’m keeping it. You go buy another one. ” Well that’s all he needed to hear. Off Joe went to TriSpot and bought his first Tri bike (a Cervelo) and he then signed up for his first Olympic distance race at Nickel City. In his first Olympic distance race ever, Joe finishes in a very respectable 2:38 (8 of 17 in AG). The following race year (2012) Joe’s athletic ambition did not slow. He finished middle of the pack in Olympic distance at Kueka and prepared for his first Half Ironman at the Musselman in Geneva, NY. 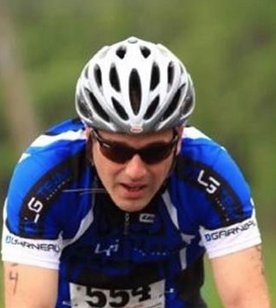 In his second season of Triathlon, Joe Rosati completes the Mussleman Half IM in 5:20. And he does so without a coach or any specific formalized plan. All his planning is acquired by reading the Slowtwitch forums, Beginner Triathlete websites and hanging out and training with BTC athletes. Training with his peers? Ummmm, no. Joe has befriended some of BTC top male IM athletes: Charlie Watson, Joe Drees, Josh Hanley and Dan Szjata. Dan is 20 years younger than Joe and the others are more than 10 years younger. When Joe brings these guys home for bite to eat after a particularly long workout, Nicole tells him: “Joe, what are you doing hanging with these young kids!? You can’t hang out with these kids!” Unfazed by Nicole’s understandable reaction, Joe lets Szjata talk him into a grueling Century bike race in Ellicotville, NY when they both win entries at the 2012 Summer Sizzler. Joe: “Szjata has this thing with me. I like the kid.” So in case you don’t know who Dan Szjata is, check out the results from Mt. Tremblant and Florida IM last year. This guy is a world class (coached) Triathlete. Through 2012 to the present, Szjata and Rosati have become good friends. Dan has helped him reach new heights in Tri sport by alternatively pushing him and pulling him back on his training and giving him structured workouts to do. They communicate regularly and a lot of Joe’s training is result of the high quality advice he is receiving from Szjata. Joe Pautler, Charlie Watson, Wills DeMoulin, Joe Drees, Joe Rosati and Dan Szajta. 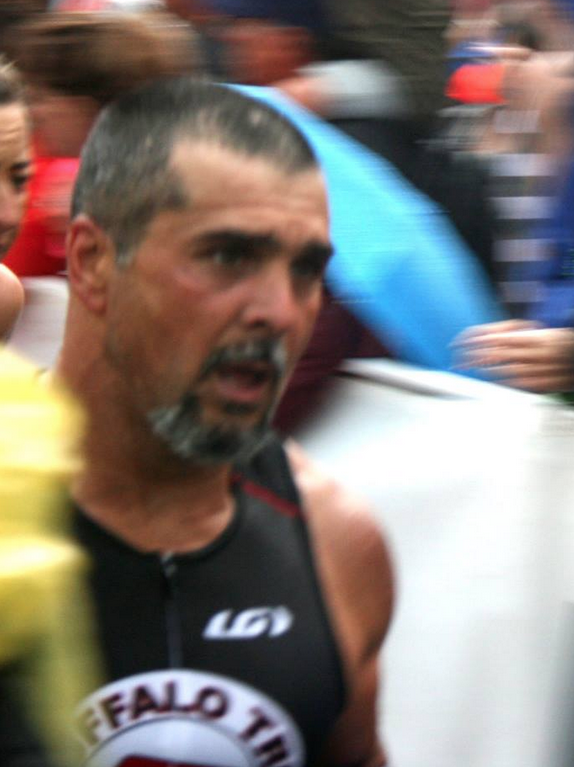 In 2013 Joe Rosati lifted his sights to the Holy Grail for New York Triathletes: Ironman Lake Placid. His early season lineup was the Grand Island Half Marathon, The BTC Spring Thing, the “TTT” in Kentucky and then IMLP. Unfortunately the ’13 season begins with a painful run at the GI Half. What Joe believes is shin splints is much later diagnosed as a fracture in his lower leg. Ignoring the pain after the GI Half he did the “Spring Thing” long course the following day. The long course is a 100 mile bike followed by a 12 mile run. Badly limping afterward, he relents to the pain and goes to PT. Despite PT Steve Gonser’s sage advice to rest and heal, Joe joins several BTC athletes at the Triple-T Ohio race the following week. (Writers note: wasn’t this time for a friendly BTC intervention?) Not for the meek, the Triple-T is: a Sprint on Friday, two Olympics on Saturday and a Half IM on Sunday. Joe packs his family up and heads to Ohio and the Shawnee National Forest for the race. After a painful but successful Sprint on Friday night, Joe starts his Olympic race on Saturday. All is well until he reaches a particularly treacherous part of the course where he crashes his bike at the bottom of a downhill just before it hits some switchbacks. Dazed, bleeding and in great pain from the leg injury, Joe tries to get up and get back on his bike. A volunteer stops him and makes him sit down while she tries to flag an ambulance. Meanwhile, two more racers crash more spectacularly in the same spot and divert the volunteer’s attention. While she is distracted, Joe mounts his damaged TT bike (bent bars and wheel) and he hobbles 12 miles back to transition. Nicole greets Joe at transition “I told you to be careful!” Adrenaline kicks in (I think he actually said “I was pissed”) from this spousal show of support and Joe is off on his run. The TTT run is a forest fire road, up the side of a mountain and down and do it again a 2nd time. Highly suffering and in lots of pain, Joe finishes the first Olympic. Race volunteers identify Joe at the finish and make him go get his wounds cleaned up. Afterward Joe, Nicole and youngest daughter Julia head back to the hotel to rest. All Joe wants to do is to sit in an ice bath and contemplate what to do. Nicole and Julia are arguing: “That’s it, we are done! We are going home!”. “No way Mom, Dad doesn’t DNF!” Joe got a bit tired of listening to them fight. He jumps up out his ice bath and heads back for the afternoon race to do the second Olympic of the day. When he gets back to the race, some BTC brothers have worked on his bike and made it rideable. Somehow he finishes that second Olympic and comes back the next day and completes the Half. The King of Pain indeed. In addition to the bodily abuse, his bike had sustained $800 in damage. After returning home, Joe did finally get an MRI on his bad leg. Sure enough he had a stress fracture. Doctor tells him…”that’s it, the seasons over”. Joe thanks him for his advice and goes home. Joe’s thinking: “Season is not over”. He insists on going to IMLP for training a few weeks later. 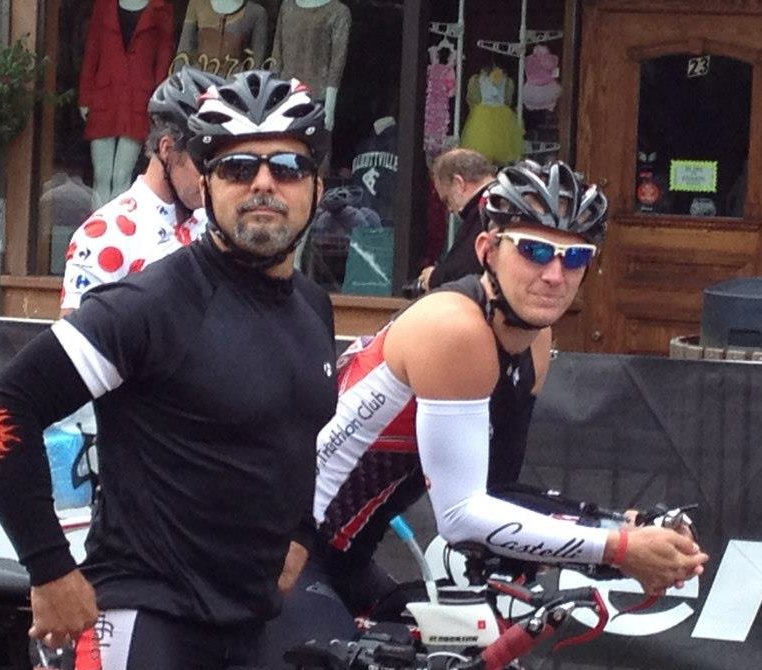 First day there, Joe and Charlie Watson and other’s do two loops of the course or 112 miles. The second day they bike 56 miles and then to top of Whiteface mountain. As Joe describes it: “That was hard! 1 ½ hours of standing bike pedaling up the mountain but I had Kristina Marques on my back wheel pushing me”. For those into numbers: Whiteface has an elevation of 4,865’ making it the fifth highest peak in New York State. Joe’s recount of IMLP: “I came back and I did placid. I knew it would be horrible. I was thinking about taking a pain killer. Steve Gonser said don’t do that. I got into swim and I got beat up. Felt like someone was punching me in the leg. I almost threw up coming out of the swim. I felt sick. Pain is bad on the bike but bearable. I get through the first leg and the pain is worse so I start taking Ibuprofen. I’m eating Ibuprofen but it’s not taking pain away. So I’m taking more. At one point I chug the bottle. I get on the run and I start puking. I think the Ibuprofen made me sick. Anytime I go to drink water…I puke. I’m dehydrated so badly that when I try and go to the bathroom nothing would come out. But it would burn. Something was going on with my kidneys. On the run my wife told me she was running backwards up a hill talking to me and I wasn’t responding to her. Gary Randolph said that at one point he stopped because I was getting sick so he stopped to check on me and I grabbed his arm. He said I had death in my eyes. But I do remember going up a hill and that Kara Klaasesz had me by the arm and that Lisa Trapasso grabbed my hand and helped me around the corner and then released me and then I started puking again. A woman spectator said “let’s get medical” and I said “no way, three miles to go and I need to finish”. My family tells me that I came around the corner and through the finish chute and that I just ran by them looking into space…wife and kids with hands out cheering me and I had no reaction… and I have no memory of this. They were wondering why didn’t dad high five us? I was in rough shape. I learned a lesson…you don’t take Ibuprofen when you race.” After IMLP in 2013 Joe did slow down the remainder of the Summer to let his leg heal. However he did race the Wineglass Marathon in October and he finished with an impressive 3:56. He reports that “at no time during the race did my leg bother me.” Apparently the King of Pain is not only a terrific athlete, he is also a fast healer. As our conversation was winding down there were a few more questions that I had for Joe that were stuck in my head: “Why do you want to go long and how do you deal with the pain?” His reply: “For me I want to see how hard I can push my body. It’s like my Harley…I like to ride hard and fast. I want to see how hard I can go and how hard I push before something gives. I don’t know that I want to hurt myself. I’m a believer that our bodies will go a lot further then we think they can. I used to tell kids I was teaching wrestling – you are going to feel some pain in practice. But your body can actually go further. Pain is a safety mechanism that our body is telling us to hold up. But if you want to win, you have to go past that point. And sometimes when you pass that point, you will find out that it really wasn’t that bad. I just needed to cross that hump.” I was also wondering about recovery. Surely to be able to deal with all this pain and rapid succession of races, Joe must give himself time to recover. He replied that “I can’t sleep. I’m up every couple hours. I’m always up by 5am. So rather than lie awake, I get my workouts done. Last year my legs hurt every day. Every workout hurt. I never recovered. I needed to stop. My thinking was I knew I was in a decline and I needed to stop but if I stop I’m going to lose fitness, so I can’t stop…the only way to go is to go harder… I didn’t realize it but I was getting worse. From my weight lifting days I thought I had to go harder through pain. That was wrong.” After the 2013 race season ended, slowing down was not a problem for Joe. Once hunting season begins, that is where he is with every free moment he has. His “up before the birds” routine works well during hunting season: “I would love to sleep on the weekends but I’m up. I just get up and get my workouts done by 9am. When everyone is getting up…I’m already done. I like getting up before the suns comes up and seeing the day begin. I like being in the woods at 5am in the dark and waiting for sun and hearing the sounds of the forest at daybreak. It’s magical to me. For updates on Joe’s 2014 season, seek him out at BTC workouts this summer or racing and volunteering at most area TRI races. He is a super approachable guy. He is an active and supportive member of our club and clearly one of a kind. Race on King of Pain! You are one tough hombre. Mike Blumenson a WNY native from the village of Williamsville, is a three year member of the BTC. He is interested in all things TRI related but is extremely curious about how Triathletes balance work, family, training and health issues. It is his attempt to share the wisdom and expereinces of BTC club members with in depth profiles to be posted here. This is the first of an intended series. Let us know if you enjoy these posts and if you want to see more. All races are part of the 2014 Score This!!! Multisport Series. More info can be found at the Score This website.